BE A SLIME AND KILL! SAVE YOUR BABIES IN SPACE! you fly in space around a map and collect your kids! The limited color palette makes get creative with things. I try my best hehe. itch.io Community » Creativity & Art » 2D Art · Replied to chipper35 in Journey to learn pixel art. Vert cool! Its a nice lil program. Thanks! This was really a side project for me but Im making this into a 3d type platform puzzle game so be expecting more soon! itch.io Community » Creativity & Art » 2D Art · Created a new topic Journey to learn pixel art. Around a month ago I started to teach myself pixel art. After years of watching some of my favorite creators and artists I decided to give it a try myself. I was never the most artistic person but I thought with time I would be able to develop my own style. I used free programs and didn't find much success and found myself in a quick rut. This was all until I found the bitsy program. I dont know how to program but always wanted to make a game myself. This simple tools allowed me to make my game but also practice my pixel art with its simple to learn tools. My game is https://smellfet123.itch.io/ghost-terminal called ghost terminal its about a lil ghost trying to find the afterlife. I would love it if you cheacked it out. Thank you for the message! I am definitely going to sick with art but for right now I need to know a lil programming for my own smaller projects. Pretty small update I just want and fixed some of the controls. Also in the upper right hand side of the screen where the point system is I added a plus ten effect whenever you collect a slime ball. Give it a look and let me know what u think! Thanks for playing! I liked the critiques so ill get to work on fixing everything. This is really my first year testing the water of game development and things have been going pretty well for the most part. Everyone in the communities I have joined have been really supportive and respectful to me and my questions on how to get into developing a games. From my early childhood years I have always been interested in the behind the scenes of game development. I started making 3D models in blender around two years ago but have been kinda nervous and hesitant to fully jump into making a game. This was until I was given a very important piece of advice " Start small with what u know." I realized I didn't have to make a huge game I could make something small and put my heart into it. I started with what I knew blender and made my first game https://smellfet123.itch.io/save-your-babies-in-space. Its very rough and I know BGE is kinda dead but it was a jumping off point for me and a very big milestone. My second game https://smellfet123.itch.io/slime is currently available in an early version but once this is done I think I will feel conformable enough to move to a better engine and really take off in my game creating future. itch.io Community » General » General Discussion · Posted in Rec me some games for kids? 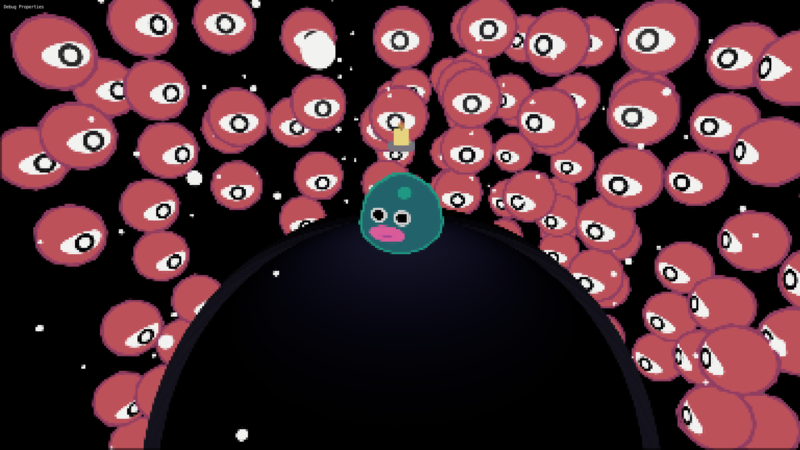 You play as a small slime collecting his missing slime balls while also trying to prevent an alien invasion. Run, shoot arrows and try to survive as long as you can while getting the highest score. This is an early build! itch.io Community » Game Development » Release Announcements · Created a new topic SAVE YOUR BABIES IN SPACE! You play as a mother duck in a fun adventure where u wander the vast space looking to save your lost children... HEHE! Let's Create Game Jam #1 community · Replied to Script Ocean Games in Game Jam Progress - Post here! I tried my own take on the super hot video matthew made. Added a cooldown and I think it looks cool with the sewer vibe of the game. Hope you enjoy my game jam project.